Earlier this week, I woke up, looked in the mirror and saw My MOM. I don't mean The Loving, Sweet Mom of my youth. No, instead, my reflection was that of The Over 40 MOM I have become much more familiar with in the last twenty years. Seemingly over night, Lines engraved themselves around my eyes and Dark Circles etched themselves just above my cheekbones. Worse, I seem to have developed Ugly Saggy Pouches that droop below my lower eyelid! How could this have happened So Fast?! Granted, this week I really have gotten very little sleep. So, that could explain The Dark Circles. And, I had a stupid fight with Good Friend, which left me crying. So, that could explain The Ugly Droopy Pouches. But, I have no explanation for The Sudden Appearance Of Fine Lines. Other than, well, other than I Am Getting Old. I can't say Oil Of Olay didn't Warn Me about Just This Sort Of Thing. You should know, I don't really look like My MOM at all. Rather, I resemble My Father exactly. I absolutely have His Eyes. So, when I looked in the mirror and saw My MOM's Wrinkles, Pouches, and Circles around My Eyes, I was a bit Disturbed. What were They doing On Me? Easily Annoyed Sister is supposed to inherit This Crap! Quickly, I checked my closet to see if I had received any of My MOM's Much-Coveted Gucci Bags in the middle of the night, as well. But, alas, I had Not. Hopefully, this Wrinkly-Droopy-Eye Awfulness is just a result of Too Many Late Nights Staying Up To Watch Tivod Season Finales this week. Over the weekend, I intend on catching up on my sleep. My Regular Youthful Glow should make its return by Sunday, I assume. Unless, it doesn't. And if that happens, well, if That Happens, I guess I am Doomed to A Lifetime Obsessing over Botox Treatments and Skin Creams. And, of course, talking to My Children LIKE THIS. 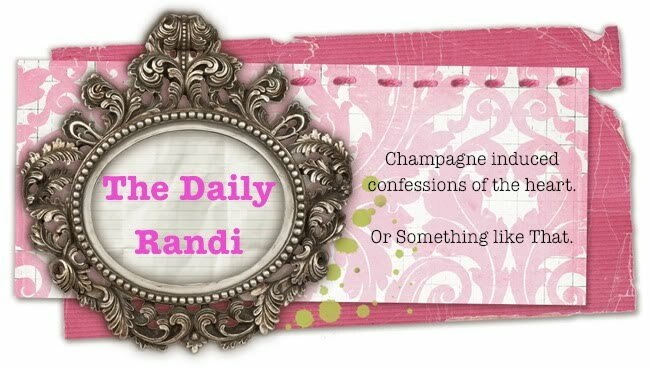 Aww Randi, just do what the rest of us do....have all your conversations in low lighting or from your back so the skin falls down and gives an instant face lift. Ta da!